Every surname has its own unique history. But approaches to that history have evolved over the last century. In the 1950s and 60s surnames were tackled in a fashion similar to placenames. The earliest spellings were collected and then the meaning was deduced, based on a knowledge of older forms of languages such as English, Anglo-Norman French, Latin and suchlike. The pre-eminent scholar in this field was a retired teacher, P.H.Reaney, who produced dictionaries of British surnames with their purported meanings. One problem with Reaney’s method however was that it took no account of the distributions of surnames and failed to link the 13th and 14th century occurrences with surnames in the 16th century and afterwards. Moreover, many of the examples amassed by Reaney may not have been hereditary at the time they were recorded. A number of the meanings he proposed have now been rejected while studies of the history of individual surnames suggest that perhaps as many as a half of his interpretations were mistaken. As we might expect, Reaney is an especially poor guide to Cornish surnames. For instance, his suggestion that Borlase means ‘a man from Bordeaux’ seems very unlikely when there is a placename Borlase in St Wenn parish, the more obvious origin for this name. Similarly, his dictionary tells us that Dower was an occupational name, meaning a maker of dough. In fact in Cornwall it was a late surname, first appearing in the 18th century and derived from the placename Dowha in Crowan. In the 1970s academics at the Department of English Local History at the University of Leicester turned from philology (the study of words in historical texts and their meanings) to the distribution of names in the past and the genealogy of specific surnames. This resulted in a series of books on English counties, incidentally including a useful one on neighbouring Devon. Their research widened out the topic to look at the role of regional dialect words and what surname history can tell us about migration in medieval times. Most importantly, they identified the way that the pattern of surnames and timing of hereditary surnames varied across different regions and social classes. In the 1990s David Hey built on the approach pioneered at Leicester. Focusing on his home county of Yorkshire, he emphasised the value of studying the distribution patterns of names at various points in time, linking this to genealogy in order to follow a name back to its source. He’s discovered that not just locative names can have a single source. Nicknames, locally-specific occupational names and even some patronymic variants display patterns that strongly suggest a single place of origin, meaning that all those now bearing that name are in some way related. This is the approach I adopt, investigating earlier patterns of surnames to see if they shed light on the purported meaning or the origins of the name. Let’s take Penrose as an example. This is a locative name from the placename meaning the end of a promontory or piece of rough ground. The only problem is that there are 11 examples of the placename straddling Cornwall from Sennen in the far west to North Petherwin in the far east. How many of these gave rise to the surname? A map of the modern distribution of the name shows a strong concentration on Truro and the Camborne-Redruth district. This would be the result of a few centuries of migration towards urban and mining areas and although it implies a western origin for the surname it doesn’t give much of a clue which particular parishes gave rise to it. 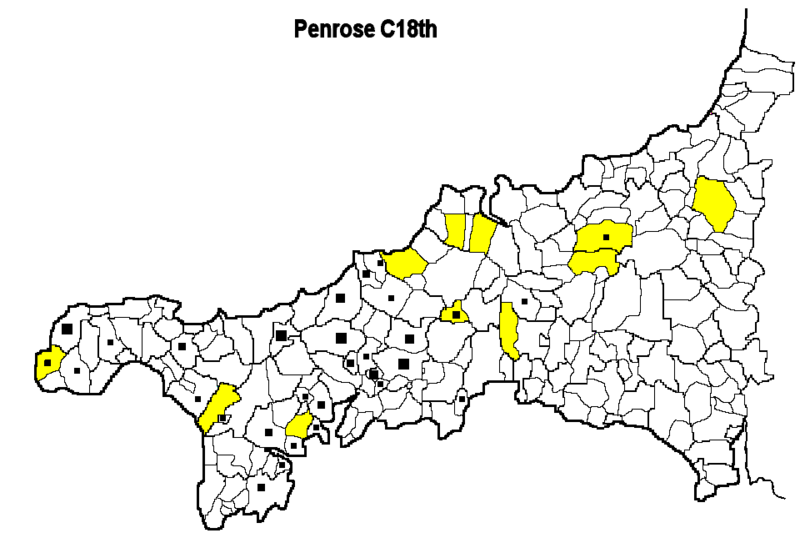 (The parishes with the placename are coloured yellow). 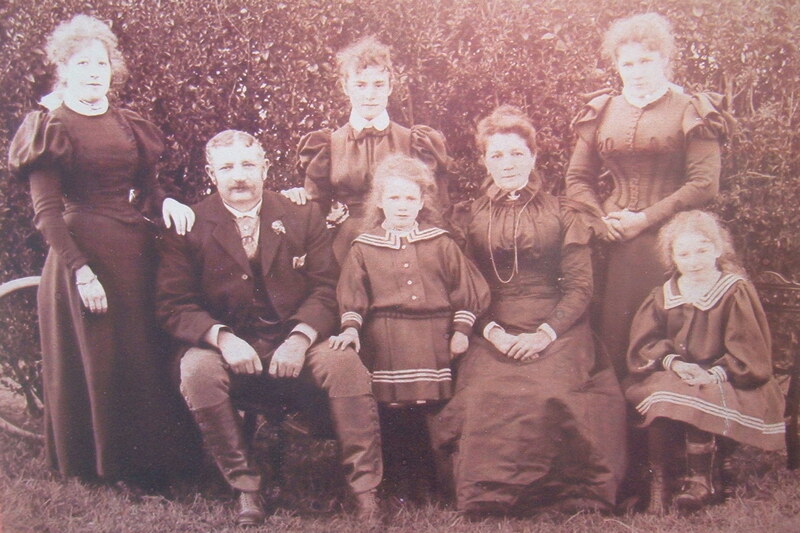 Richard Penrose and family in the mid-1890s. He’d emigrated to the States in the early 1870s with his wife and brother. His brother stayed; they returned. If we go back 150 years or so to the 1861 census we see that the name was similarly confined largely to the west, but without any marked concentration on Truro. Instead, the mining parishes of Redruth and St Just in Penwith were the main homes of Penroses, many of whom presumably emigrated. As in fact did my great-grandfather, although he’d returned within a decade from California. Let’s travel further back, to the 18th century and look at the names of women in the marriage registers – women because marriages usually took place in their parish of residence. The marriage register data suggest that the distribution of Penroses at this point resembled that of 1861, but with a more scattered distribution. For instance there were Penroses on the Lizard, although these seem to have migrated northwards to the burgeoning industrial areas between the mid 18th and 19th centuries. We can go back another 100 years to 1641, when the government asked/forced people to pledge their loyalty to crown and church by signing a Protestation list. The pattern of the name Penrose in the 17th century looks a lot more restricted, clustering from Cubert on the north coast down through the Fal river valley to the eastern side of the Lizard. There were some examples to the west but none at all in the east. 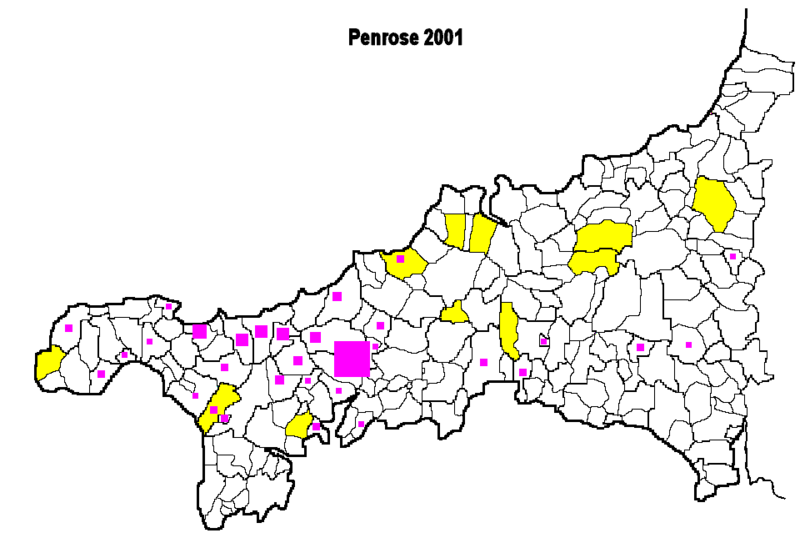 Does this pattern imply that the Penrose placenames in east Cornwall hadn’t given rise to the surname? Or had they in earlier centuries but the families had died out or moved west? The latter is not impossible although westwards migration in the period from the 14th to 17th centuries – before the rise of copper mining – was much less likely than after the 1700s. Or perhaps the assumption of solely western origins for Penrose is premature. Look at the earliest examples of the Penrose name, in the early 16th century lists of taxpayers, supplemented by a few earlier references from the 15th century. In the west, these are likely to coincide with the more general transition of unstable bynames to stable surnames. Rather suspiciously, the 17th century focus on the Fal and the Truro area is not visible. At this point a health warning is in order. Unlike the 19th century censuses, the 16th century subsidy lists include only around half the number of households, if that. Many family names would have been missed, so the absence of evidence for a name doesn’t necessarily mean the absence of the name itself. Nonetheless, the distribution of Penroses in the early 16th century, especially in the west, is striking, as the surname tended to crop up relatively close to the placenames. From this map, it looks likely that Penrose had multiple origins, with placenames in Sennen, Sithney, Budock, St Columb Minor and St Ervan all giving rise to the name. Furthermore, there are hints that the Penrose placenames in the east, at Blisland/St Breward and North Petherwin may also have given rise to the surname Penrose, although these families later died out or moved out. While a geographical approach can offer valuable insights into the origin and subsequent migration of families, it doesn’t answer all our questions. It’s impossible to avoid a considerable amount of (hopefully informed) speculation. Moreover, ideally it should be supplemented by detailed genealogical research to try to tie families together, a tricky task for the period before the 1540s. Nevertheless, it provides an essential framework for more detailed family history research. Very interesting. My Penrose family has lived in Penzance since about 1765. I have had no luck finding where they came from prior to that date.